One Saturday morning, the Wauwatosa Police Department called the WHS Wildlife Rehabilitation Center for help. 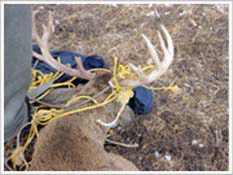 An employee of a local golf course had called to report that a large buck had become entangled in many yards of nylon rope, wrapped around his antlers and wound around a tree. 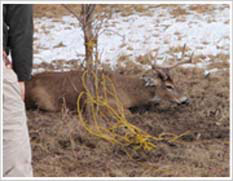 Two of our WHS Wildlife Center staff grabbed specialized rescue equipment and headed over to free the struggling deer. 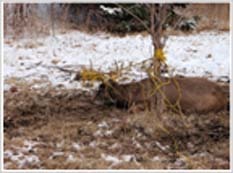 Once on the scene, our rescuers could see that the deer, Guy, was indeed in quite a predicament. Guy was tethered to the tree by a big, messy tangle of rope. Guy had obviously been struggling for several hours and had even churned-up the ground all around the tree. He looked tired, highly stressed and just miserable. One of our rescuers approached Guy and used a pole-mounted syringe to administer a dose of tranquilizing drug to the struggling buck. In a few minutes, Guy was sleeping peacefully. Our rescuers monitored Guy’s vital signs and began cutting away the yards and yards of rope. Our rescuers marveled at the complexity of the tangles and how long Guy must have struggled against the rope to become so profoundly entangled. When the ropes were all removed, our rescuers administered another injection to help reverse the effects of the tranquilizer. Over the next 30 minutes, Guy gradually came out of the sedation, rose to his feet and galloped back to freedom! Everyone involved was delighted that WHS had the capability and experience necessary to help Guy. Your support of our Wildlife Rehabilitation Center helps us continue our lifesaving work for wild animals like Guy!